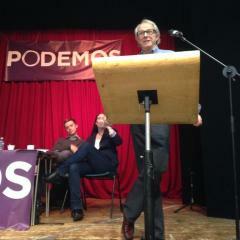 Hundreds attended a meeting packed to overflowing – mainly young people, many Spanish – in London this weekend to hear a three-way debate between Owen Jones, Ken Loach and leaders of the new Spanish organisation Podemos, which took five seats in the European Parliament in May just three months after being formed. One of the new MEPs, Tania González Peñas, spoke from the platform. Podemos (“We can!”) was inspired by the radical left force in Greece, Syriza. It grew out of the mass protests in Spain of the last three years, the Indignados movement. It fought the European election campaign on a tiny budget, much of it funded by small online donations. To universal surprise, it polled 1.2 million votes, drawing considerable support from younger voters, running on an anti-austerity programme that was produced in a way very different to the opaque processes used by the traditional party elites. Utilising social networks and online media, large numbers of supporters helped write Podemos’s programme. Amendments were discussed in local party circles and put to online referenda. Candidates were chosen democratically through open primaries. Over 33,000 voters took part, giving those who voted a real sense of ownership of the movement. Since the European elections, Podemos have consistently polled around 20% in opinion polls in Spain. One recent poll in the province of Andalucia, traditionally a heartland of the PSOE, had Podemos on a higher rating than both the PSOE and the PP together. With both national and local elections due next year, the “caste” should be very fearful indeed. Posted in: Europe, International, Politics.